Bill Murray is on the road. Calling from Charlotte, N.C., where it’s well after midnight, he and classical cellist Jan Vogler are winding down after a performance on their unusual tour, which sees the famously quirky movie star singing – yes, singing – and reciting literature with a chamber trio, of all things. For such a spontaneous spirit, maybe it’s no surprise that Murray, 68, would take a late-career dive into music. After all, there are countless stories circulating of Murray crashing real-life situations like some affable genie before exiting as unexpectedly as he arrived. He often materializes at indie rock gigs – catching bands like Rilo Kiley, Best Coast, Kings of Leon and Girlpool – and has been spotted riding kids’ bicycles down the aisles of Walmart. He has crashed engagement parties, suddenly bartended at a music festival and even once washed the dishes at a party in the home of some strangers. His unlikely partnership with an acclaimed cello whiz sounds a bit like that too – Vogler, who hails from Germany but now lives in New York City, met Murray on an international flight, and their friendship and collaboration grew organically. The show launched by their partnership has toured the globe, including performances in Portland last fall, with no signs of slowing down. The man is no stranger to travel – he has often shot on location across his 40-year movie career – but bouncing from city to city each night is new for him. It’s just another part of the learning curve for his left-turn musical team-up with Vogler, which has so far yielded the 2017 album “New Worlds” and a widening tour. 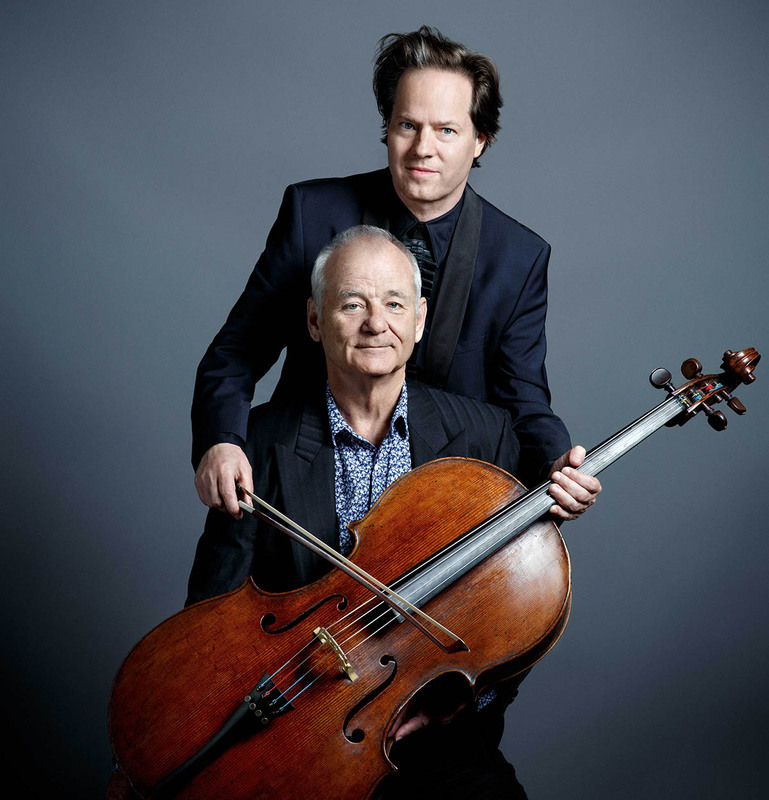 Bill Murray and classical cellist Jan Vogler. For Murray, who minted his withering wit and deadpan charisma in pop-culture touchstones like “Ghostbusters,” “Groundhog Day,” “Caddyshack” and “Rushmore,” and the early days of “Saturday Night Live,” this isn’t his first brush with music. Playing the carefree bear Baloo in the 2016 remake of “The Jungle Book,” he sang “The Bare Necessities” with a winsome drawl. And, on the 2015 Netflix special “A Very Murray Christmas,” he dug into lovable holiday standards alongside Miley Cyrus, George Clooney and members of the French rock band Phoenix. But, as Murray tells it, the Christmas special was a major confidence boost. While Murray’s singing is decidedly unpolished, that’s key to its charm. Plus, one can’t help but hear echoes of his various film and TV roles from over the years – and start to smile and chuckle before he even cracks a joke. On the “New Worlds” album and tour alike, he tackles irreverent versions of showtunes like “Ain’t Necessarily So,” “Moon River” and several selections from “West Side Story,” accompanied by a chamber trio consisting of Vogler on cello; Chinese violinist Mira Wang, who is married to Vogler; and Venezuelan pianist Vanessa Perez. As if that’s not enough, Murray recites prose and poetry from Mark Twain, Ernest Hemingway, Walt Whitman and others. So how do fans of Murray’s wise-cracking comedy take to him dabbling in the greatest hits of American literature? It helps that Murray and company are open to improvising from night to night, playing around with distinct versions and even catering encores specifically to the vibe of a given audience. And if you think Murray’s singing is only for laughs, his centrepiece rendition of Van Morrison’s “When Will I Ever Learn to Live in God?” is decidedly emotional, his cracked voice radiating surrender. Coming from such different worlds, do Murray and Vogler have much shared taste? Some pieces are tougher to crack than others, and there’s one in particular that’s still not quite ready.